Dr. William H. Noh is a dual degree Oral & Maxillofacial Surgeon who grew up in Southern California and went on to complete his Doctorate in Dental Surgery (DDS) at the University Of Pacific School Of Dentistry in 2009. While there, he served as the Class President and was inducted into the Omicron Kappa Upsilon Society where members are selected from the top 10% of the graduating class. One of his distinguished accomplishments at the University of Pacific School of Dentistry included starting an annual service program to Jamaica which provided underserved communities with oral surgery care; He worked hard to develop this program and to this day it continues its annual service and has expanded its outreach locations. 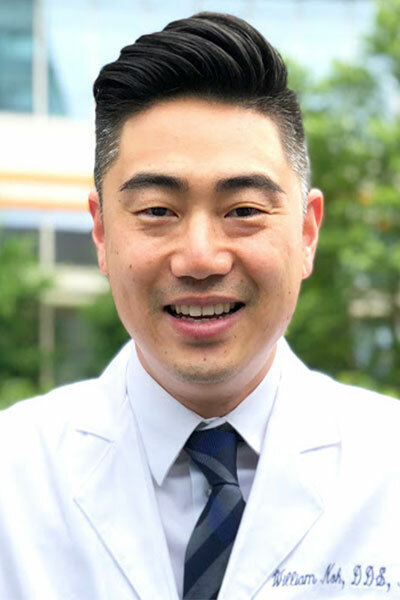 After completing dental school, Dr. Noh was accepted into a six year Oral & Maxillofacial Surgery residency program at the Hospital of University of Pennsylvania and the Children’s Hospital of Philadelphia. In conjunction with this program he completed his Doctorate in Medicine (MD) at the University Of Pennsylvania School Of Medicine. His training was completed in 2018 after serving as the Chief Resident in the Department of Oral & Maxillofacial Surgery at Penn Medicine. Currently, he is an attending physician at Hackensack University Medical Center and Palisades Hospital. In addition he is a member of the American Association of Oral & Maxillofacial Surgeons, American Medical Association, American Dental Association, American Dental Society of Anesthesiology, and New Jersey State Society of Oral & Maxillofacial Surgery. He is well versed in all aspects of Oral & Maxillofacial Surgery with particular interests in preprosthetic procedures, orthognathic surgery, TMJ, and Facial cosmetics (Botox, fillers, and scar revisions). We are excited to have Dr. Noh join our practice as he continues to uphold our practice philosophies of evidence based medicine, contemporary surgical techniques, and transparency with all of our patients.